Sean's Ramblings: Where Can You Find Cherikee Red? Where Can You Find Cherikee Red? As a child, I often went to Rhoda's in Squirrel Hill with my aunt and uncle and had matzah ball soup, a hot dog or sandwich and a can of Cherikee Red pop (yes, I said pop). I'm not sure how well these items went together, but I really enjoyed these meals. Anyway, if you're not familiar with Cherikee Red, you're missing out on this cherry pop magical deliciousness. I haven't seen Cherikee Red in years, so I turned to the internet* to see if the product still exists. Last February, the Pittsburgh Post-Gazette published an article by Andrew Seder (why is the writer different than all other writers?) titled "Cherikee Red: Rediscovered Soft Drink From Scranton Makes Comeback But Still Is Scarce." Essentially, Cherikee Red's back. All right! However, where can you find this refreshing and probably low-calorie soft drink? There's a Bring Back Cherikee Red Facebook group that shows some businesses that carry Cherikee Red, but this page hasn't been updated in nearly a year. More importantly, I don't see the product carried anywhere outside Pennsylvania. Here's my challenge to you. If you see Cherikee Red, post a comment here about where you found it. Bonus points if you see Cherikee Red anywhere in the DC area. Maybe I should ask my local Wegmans to carry Cherikee Red. As a bit of a tangent, the Washington Redskins should really sell Cherikee Red at FedEx Field. Seems like a perfect match. * Where I quickly discovered that Cherikee Red is Cherikee Red and not Cherokee Red if that makes sense. I can buy it at my local Giant sometimes here in Baltimore. Ev - I make it to Baltimore fairly often, so would you mind e-mailing me at seanramblings at yahoo [dot]com to let me know which Giant. 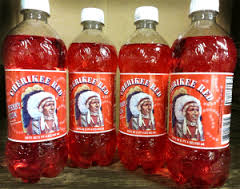 I went to see my niece I'm Pennsylvania and bought some in a 20oz bottle in Carbondale pa at turkey hill store and also at sure fine grocery store in Clifford pa. It is intended to be thought of as "Cherokee Red" but is a play in words in regards to the "Cherry" ultimately being spelled "Cherikee Red". This soda is mostly found in northeastern pa Scranton/WilkesBarre area since it was once produced there. I found the mother load in Northern Cambria at Giant Eagle.